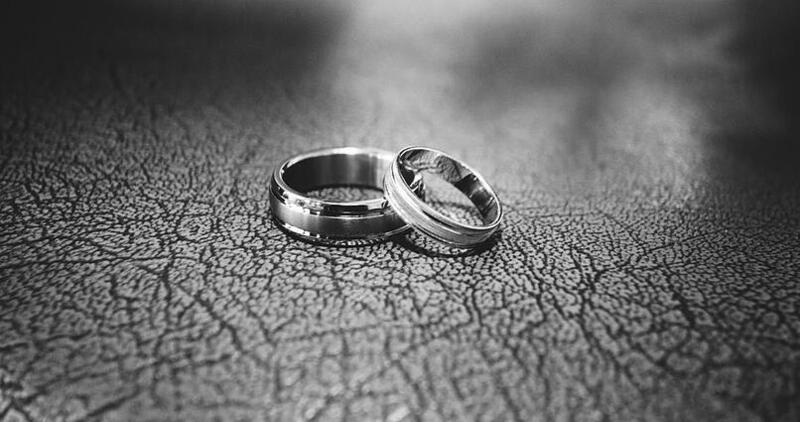 While we’ve spent plenty of time talking about engagement rings, diamond rings, diamonds, selling diamonds, and even ring settings, we’ve yet to discuss the importance of choosing the right metal for the band of your wedding ring. We’re going to spend some time talking about men’s wedding rings and how they roll. We all know that silver can tarnish like metal left out in the rain, therefore the two hottest picks for ring bands are gold or platinum. These metals give us all the sparkly appeal of silver, without the tarnish or the trouble. Platinum and gold are precious and desirable metals, each with their own quirks and nuances. While choosing between yellow gold and white gold is a matter of personal preference, both contain the same gold content purity. White gold and platinum rings are quite similar in appearance, until you take a closer look. What Makes White Gold White? 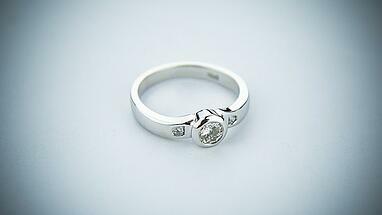 White gold rings contain gold and alloys, and are coated in a rhodium plating. While 14k white gold and 14k yellow gold both contain 58.5% gold, the alloys are different colors and therefore alter the appearance of the ring. The alloys and the rhodium contribute to the white/silver appearance of the gold. However, there is a risk that as time goes on, the coating of the ring will fade and the ring will take on a yellowish appearance. 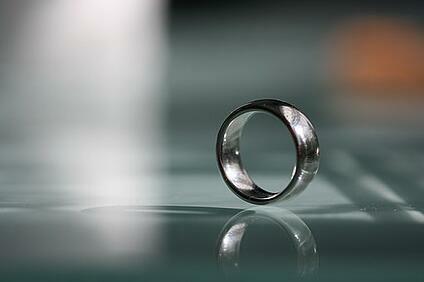 This can be prevented by polishing and re-plating the ring as necessary. Will Platinum Ever Turn Yellow? The answer is, No. Platinum is naturally white and will never fade to any other color -- although it will decrease in shine. Furthermore, platinum is much more durable than gold. This is something to keep in mind when choosing a wedding ring which will hopefully last a lifetime. Platinum is considered to be one of the strongest and most enduring metals in the world, as well as one of the heaviest. Platinum’s reliable white coloring is complementary to diamonds and other precious stones. Does White Gold Scratch? Does Platinum? Platinum is more likely to scratch than 14K white gold. While the two metals look extremely similar, platinum is ironically both stronger and softer than 14K white gold. While both metals will eventually become scratched, platinum scratches are oddly desirable as they may develop into something called a patina finish. A patina finish is a thin layer that forms on the surface of certain metals. This can give the ring a unique look, marking its age and making it look unique and special. However platinum is known to need a polish here and there as well in order to avoid a lackluster appearance. After a few years, white gold may start to fade and lose its whiteness. It may even scratch and further lose its coloring. But worry not -- polishing and taking care of the ring will keep it looking shiny and new. Additionally, 14K gold is more durable than 18K gold and is less likely to scratch. Also, 14K white gold is shinier than platinum, point blank. The smoother the surface of the ring, the more comfortable it will feel against your other fingers. In other words, the plainer the band, the more comfortable the fit. Avoiding sharp edges or raised patterns is a great way to keep your ring simple and enjoyable to wear. Comfort-fit rings are specifically made with a domed interior -- allowing for as little contact with the skin as possible. 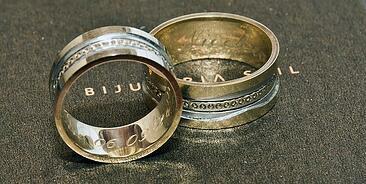 While many prefer a thicker wedding band, thinner bands are notably more comfortable and much lighter. With that said, we may recognize that the lighter the ring, the easier it is to wear. 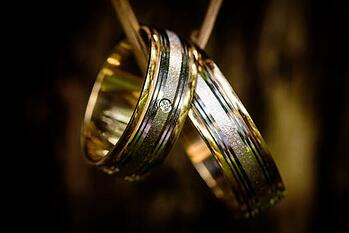 As platinum is heavier than 14K gold, most people find gold wedding bands to be more comfortable. In fact, platinum is 40% to 60% heavier than white gold, which is something to keep in mind when factoring in comfort. Good question. Due to its rareness and its weight, platinum costs more than 14K gold. As a platinum ring is made up of 90% to 95% platinum and a 14K white gold ring is made up of 58% gold, it makes sense that you get what you pay for. Can Anyone Tell the Difference Between White Gold and Platinum? From a distance? Probably not. The difference is much more noticeable to the wearer of ring as opposed to its onlookers. While platinum is more durable and white gold is shinier, there are many aspects that make these metals unique in their own ways. 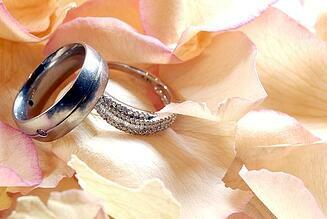 At the end of the day, choosing a wedding ring is a matter of personal preference and lifestyle.